The RIPE 59 Meeting took place at the Hotel Corinthia Lisbon, Portugal, from 5-9 October 2010. More than 330 people from 33 different nationalities attended. The RIPE 59 Meeting’s opening session plenary kicked off with IPv6-related presentations from Marco Hogewoning (XS4ALL) and Jan Schöllhammer, (AVM), an account from Martin Pels about AM-SIX’s MPLS/VPLS deployment and a review of 4-byte Autonomous System (AS) Number deployment from APNIC’s Geoff Huston. The second plenary session continued the IPv6 theme with presentations focused on the practical side of IPv6 implementation and the issues that arise post-implementation. France Telecom’s Christian Jacquenet outlined his company’s IPv6 migration strategy. Having worked on the deployment of IPv6 at HEANET in 2003, Dave Wilson talked about post-implementation issues and presented a business case for IPv6. Fernando Garcia looked at the status of real-world IPv6-enabled websites in his presentation, and the session concluded with an interesting report from Carlos Friaças on a project that assists those with special needs using the Internet and IPv6 in particular. Both plenary sessions provoked plenty of comment and debate. You can download presentations from the plenary sessions. The RIPE Certification Task Force met on Monday morning to discuss progress with the technical and policy development of the RIPE NCC certification system. An report of this progress will be given during the RIPE NCC Services Working Group on Wednesday afternoon. Google was the sponsor of the first social event of RIPE 59. Although the grey skies over Lisbon meant that the event had to be relocated indoors, Google’s drinks and snacks attracted a large crowd. Tuesday morning started with a round-up of news from the Regional Internet Registries (RIRs), an update from the IANA, a report from the Address Supporting Organization (ASO), and an update from the Number Resource Organization (NRO). The second Plenary session was dedicated to RIPE Labs - the new platform for the RIPE community. RIPE Labs is the place to expose, test and discuss innovative Internet-related tools, ideas and analysis. The RIPE NCC’s Mirjam Kühne and Robert Kisteleki and Franz Schwarzinger introduced the new initiative. They gave an overview of Labs and its content and showed demos of some of the tools, including the RIPE NCC’s NetSense. The final Plenary session of the day featured several presentations on DNSSEC, including the announcement from Joe Abley of ICANN and Matt Larson of VeriSign that a draft timeline for signing the root zone has been prepared, with full roll-out planned for 1 July 2010. There will be more discussion of this in the DNS Working Group session on Thursday. The session concluded with the presentation of the results from the European Commission’s IPv6 Deployment Survey, which included comparible data from ARIN and APNIC. The week’s first working group session, the IPv6 Working Group, took place in the day’s final session, and included a discussion of the future of the working group. This resulted in the decision to re-write the working group’s charter to include a focus on IPv6/IPv4 interaction. The attendees in the session also agreed to hold an “IPv6-only hour” at future RIPE Meetings. The session closed with a panel discussion about the obstacles to full IPv6 deployment and a live online survey of the session attendees’ thoughts about IPv6 deployment. There were two packed Address Policy Working Group sessions on Wednesday. There was some discussion on the proposal 2009-03, “Run Out Fairly”. At the end of the discussion, the general feeling in the room was to go forward with it. 2008-07, “Ensuring Efficient Use of Historical Resources”, will be reworded and this will probably lead to a new version of the proposal. An alternative proposal to replace the current last /8 proposals was presented. It was proposed that some minor changes be made to the current policies rather than creating a new policy for the last /8. The RIPE Certification Task Force also presented an update on their progress. The update was well received and prompted some discussion. The Cooperation Working Group met in the first afternoon session. Following the installation of Patrik Fältström as working group co-chair and an update on the German government’s IPv6 deployment plans, the presentations focused on the upcoming Internet Governance Forum (IGF) and the changing Internet governance landscape. A presentation by ICANN’s Nick Thorne prompted some frank assessments and discussion about the International Telecommunications Union’s (ITU) interest in becoming an Internet registry. The day concluded with the RIPE NCC Services Working Group session and a packed agenda. The session included the update from the RIPE NCC and an overview of the Contractual Relationship Requirement for End Users project. An update on certification prompted a great deal of discussion. A proposal was discussed to introduce INET(6)NUM and AUT-NUM Objects to Reference Sponsoring LIR - further discussion will be initiated on the NCC Services mailing list. Piotr Strzyzewski suggested that RIPE NCC members be surveyed about their experience dealing with the RIPE NCC, specifically in relation to the implementation of 2007-01. There was positive feedback from the room and this topic will be included in the next RIPE NCC Membership Survey. The Database Working Group met on Thursday morning and included updates from the RIPE NCC Database Group, input from other working groups and task forces, and discussion of RIPE Database documentation. Piotr Strzyzewski made two proposals for new database functionalities, which spurred some discussion of the protection of data. Rüdiger Volk’s presentation about “Practically Improving Security of Routing Information” resulted in some questions about how this topic should be further discussed and the role of the IETF. As there was no time for Rob Evans’ presentation on “IPv6 Routing Aggregation Recommendations”, he will deliver it in an extra session to be held on Friday morning at 10:00 is the side room. The German Ministry of Defense gave a presentation about IPv6 deployment on their network. Attendees found this presentation interesting as it was quite different to the usual IPv6 network deployments that are presented by operators during RIPE Meetings. Nick Hilliard presented his idea for a new policy proposal, “IPv4 Temporary Assignment Pool” and it was decided that this should be discussed further on the Address Policy mailing list. Axel Pawlik, of the RIPE NCC, gave an update on the current status of policy proposal 2009-01, “Global Policy for the allocation of IPv4 blocks to RIRs”. It was decided that the RIPE community will stall this proposal until the ARIN community makes a decision on its version. Dave Wilson made a presentation to propose a change in the RIPE Policy Development Process (PDP) so that there will be an extra stage for global policies. He will move forward by sending a formal proposal to the mailing list. There was also a short discussion on how the RIPE NCC Registration Services should handle multiple ASN requests from the same organisation. Details on this subject will be sent to the mailing list. Highlights of the first session included Stephane Bortzmeyer’s report on the free DNSwitness software. Stephane reported that the software detected an increased usage of IPv6 to access services relevant to ISP operations. The second session featured a Lame Delegation Analysis from Shane Kerr, the ICANN/OARC Root Zone Augmentation Impact Analysis from Duane Wessels, and a lengthy discussion of root zone scaling, following on from Lyman Chapin’s presentation of Root Zone Scaling Survey Findings. The session closed with the WG endorsing an open statement to ICANN/Verisign, commending them on the decision to sign the root. The two EIX sessions had reports from over 20 Internet Exchange Points. The afternoon session also included the premiere of the winning film from the Euro-IX film competition, entitled “The Internet Revealed”, which was warmly received by attendees. The Anti-Abuse session included a lengthy discussion on recent list discussions about abuse contacts and sanctions. Highlights of the session included presentations on Dutch ISP Antibotnet Action by Marco Hogewoning, Phishing Lock by Ian Meikle and an overview of the RIPE NCC tools for Anti-Abuse by Emile Aben. An extra Routing Working Group session was held on Friday morning. Rob Evans gave his presentation, "IPv6 Routing Aggregation Recommendations", during the half-hour slot. His presentation generated a lot of discussion. The final working group session took place on Friday morning and included the Tier-0 Report by Anand Buddhdev and presentations on NRENUM.net on the Portuguese NREN and on ENUM in Portugal by Rui Ribeiro. The RIPE 59 Meeting came to an end on Friday. Presentations included an overview of the BIRD Routing Daemon by Ondrej Filip and an analysis of "A Day In The Life Of Internet Traffic" by APNIC's George Michaelson. Data from this project will appear shortly on RIPE Labs. Two working groups decided to redefine their charter during the meeting week. Ian Meikle explained that the Test Traffic Working Group had noticed that its work is now broader in scope than when the working group was initiated ten years ago to encourage the use of the Test Traffic measurement network. It was agreed that the working group's charter would be updated to reflect this and to encourage more participation. The charter will be sent to the Test Traffic Working Group mailing list and a new charter will be presented at RIPE 60. The IPv6 Working Group had a lengthy discussion about its charter and the consensus was that the current charter does not meet the working group's current needs. Shane Kerr explained that volunteers have already identified the key points for changes to the charter and will circulate a draft to the IPv6 WG mailing list. 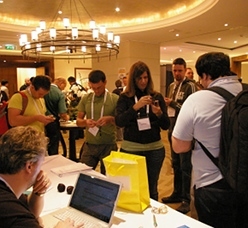 The working group hopes to present a new charter at RIPE 60. Rob Blokzijl encouraged all those interested in contributing to the charters to take part in the discussion on the mailing lists. The DNS Working Group's Response to Root Scaling Studies Jim Reid presented the statement that the DNS Working Group would like to issue on behalf of the RIPE community. This statement thanks ICANN/ Verisign for listening to the previous statement that the RIPE community issued at RIPE 56, which called for the root to be signed. There was much support for this statement from the room. Number Resource Organization Number Council (NRO NC) Elections Selection took place during the final Plenary session. Dave Wilson was, selected by the RIPE community to take the vacant seat on the Number Resource Organization (NRO) Number Council (NC). He will serve a three-year term that runs from 1 January 2010 to 31 December 2012.